Want to plan an unforgettable themed party that everyone will love? A themed party is not only majestic, chic and organized, it always stands out to create lasting memories. DIY projects are unique and so much fun to make any occasion memorable. Some valuable tips for any themed party is included. It's always easy to simply purchase the themed party decoration kit/supplies and throw a party. But don't you want to host a unique party with your personal touch to remember? Something to stand out with a striking centerpiece or backdrop without breaking the bank? Ideas are invariably unlimited for themed parties and they are always easy to pull together. 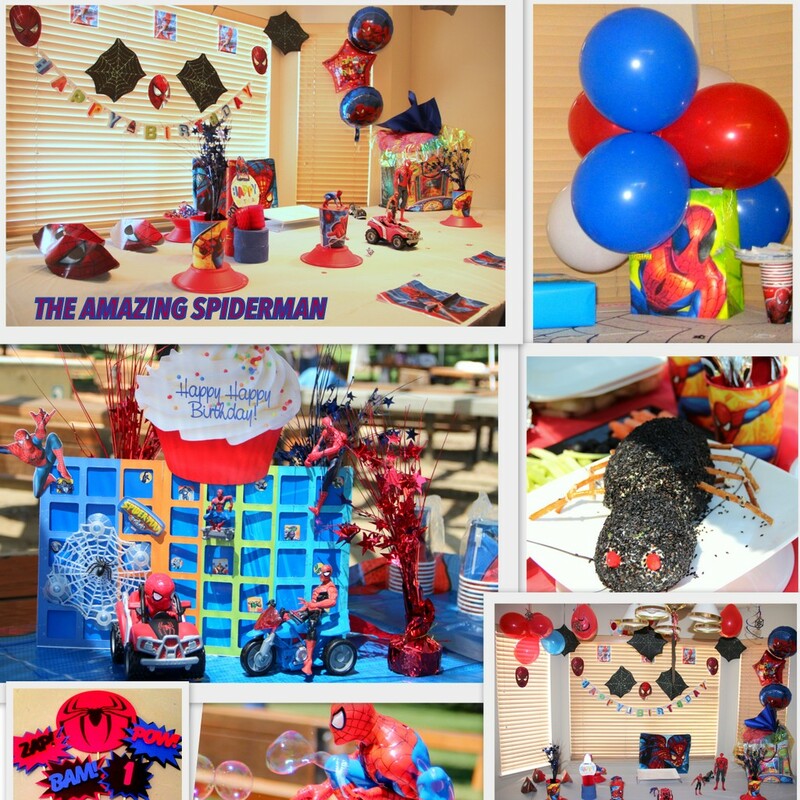 If your boy/son wishes to be Peter Parker being a big fan of Amazing Spiderman, then this superhero themed birthday party will likely be his favorite and memorable one. I have attached few pictures taken previously on my son's birthday parties as we didn't pay much attention to capture all the details. Created an illustrative miniature version just for you. Ideas are flooding in currently as I decide to blog. Let's make the birthday boy and his buddies swing from web to web. Always start with the color scheme, certainly you might know its major color being red, and blue; black and some yellow can be used to accentuate these dominating colors if you like. Next, coming to the ceiling. Draping plain colorful plastic tablecloth (same color scheme) on the ceiling gives an instant lift for the eyes. Bright red or dark blue works very well. For this spidey theme, we may add a large web using yarn or streamers on the ceiling. 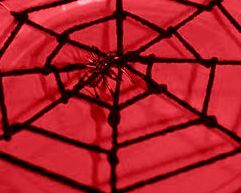 The web can also be spun in a corner that is visible. Drawings of webs on black construction paper using glitter glue and cut-out in the same shape also works well. These webs were used for a game previously, is reused to hang on the ceiling or on walls or spread out randomly on the table. Halloween decor webs can also be reused for this theme. Use helium balloons else regular balloons attached to string (about a foot long) can be hung upside down for a similar inexpensive effect. Along with balloons, I have attached small webs that was in my son's toy box for an added effect. A tablecloth can act as a striking backdrop as well. Whether you purchase or make one is up to you, it certainly makes a huge difference. Centerpiece will always be the focal point. I created my centerpiece with plain cardboard and made a template to cut out squares. Stuck some stickers, cut-outs from toy-boxes and added some spiderman figures hanging. 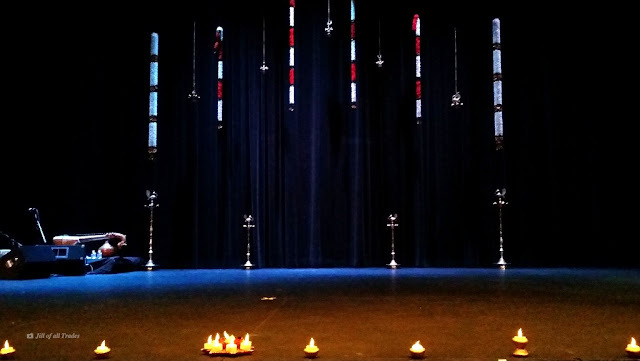 For more colorful effect, decorative party table weights were used behind the centerpiece. If you don't have the time to make one, at least use some of your child's toys (stick to the same themed toys) that is lying in his/her room or toy box. I added some spidey vehicles from our toy box. A large spidey gift bag with a bunch of balloons tied to it also can act as a centerpiece to avoid an empty table. Themed tableware (bowls, plates, cups) and also unused streamer rolls can be used to give height and color to the accent pieces. A few cut outs or posters, stickers of spiderman or even masks can be used on the display tablecloth to look unique instead of the store bought same themed tablecloth. Red/ White colored plain plastic table cloth can be spread out to draw a huge web using thick markers/sharpies. You may also cut out extra spiderman loot bags and tape it as a border on the table or as table skirt. For some props, write some words in bold like "BAM", "POW", "WHAM! ", " BANG", "POP", "KRUNCH, "SMASH! ", "ZAP" etc.. on foam or construction paper and attach it to a lollypop stick to act as props on the cake table. Ask your son, he might come up with more to make your job easy. Spiderman bubble maker can also be used if its outdoors. The birthday boy's chair can be draped with the same themed blanket, towel or even a robe can be draped. Spiderman finger rings are decorative cake toppers, kids would love to take one home. I also made a spider dip for chips (artichoke dip shaped into spider and finished with black sesame seeds and pretzels for its legs.) Don't forget to dress up the kid appropriately. An adult in his spiderman (halloween) costume can be a good surprise for the birthday boy's wish come true! Hope these tips and guidelines might be of help for your next upcoming birthday party. Please add a comment below if this topic interests you or might be of any use. Your inputs will guide me decide if I should continue on party decor page. Thanks for stopping by!